First of all, the only people in a coma over this game are the gibbering unthinking mass who couldn’t be bothered to play a title for more than 5 minutes unless it has the word “Madden” in the title. Bioware is taking an honest stab at trying to make the STORY interesting, and you’re gonna take a dump all over it because it didn’t have any action?. You remember STORY, right? Yeah, it’s that thing that happens in some games while certain Joystiq writers are trying to figure out which end of their controller is up. Sorry, didn’t mean to interrupt your frathouse shenanigans with our plot development. Honestly, for the kind of people they need to attract to this game, this video is perfect. Most Star Wars fans will think this is downright cool, especially if they played KotOR thinking “Gee, this would make a cool MMO.” Darth Malak FTW! These are the same kind of people that were super-hyped about Star Wars Galaxies and then were horribly defeated by SOE’s ineptitude. Listen twerp, I LIKE DENNY! 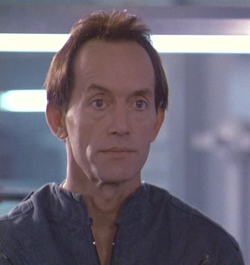 Oh, and I should probably point out that “Denny” is actually Lance Henrikson. You might know him from such films as Aliens and the Chris Carter television series, Millenium. I bet I know who else balked at this video. The guys that thought Enterprise would be SO much better if they just added THE BORG! Forget that your characterizations are shallow, your concept of Vulcans are totally broken, and your opening theme song is about as inspiring as a kick in the junk (they both make me want to chunder). World of Warcraft doesn’t always do the best job of telling their story, but with the latest expansion, it does it right at almost every turn, from the Battle at the Wrathgate all the way to Loken, Hodir, and Storm Peaks. Did Warhammer Online underwhelm because of a lack of story-telling? I don’t know. I’m sure people that spent more time in there than I did might be able to come up with better reasons, but I can honestly say I would’ve stuck around longer if Warhammer Online did a better job of telling some kind of story… any story really. I’m sure there was some lore spread around, but it just didn’t come through in the course of leveling. Basically, I see two possibilities: WoW is huge because it has an awesome story, or WoW has an awesome story because it’s so huge. I would love it if SW:TOR has as much depth to its story as WoW. And based on this video that Joystiq was so quick to dismiss, it really seems like it will. Congrats, Bioware. You just won me over a little bit more. Coma averted!